What do you think about when your mind wanders? Me, food. I think about food. I think about things that would taste good. I think about recipes, and how things would taste when combined with various ingredients. Today I was dreaming of scallops. I was dreaming of scallops sauteed in hazelnut oil, topped with roasted hazelnut and carrot puree. So when I got home today, I set up everything to fix that dinner I had thought of all day long…. except that I did not have the main ingredient: Hazelnut oil. Grrrr…. What to do now… My carrot puree was already prepared. I guess I could have simply added sauteed scallops to it, but this would have not satisfied me. So instead I set put to prepare a total different dish. 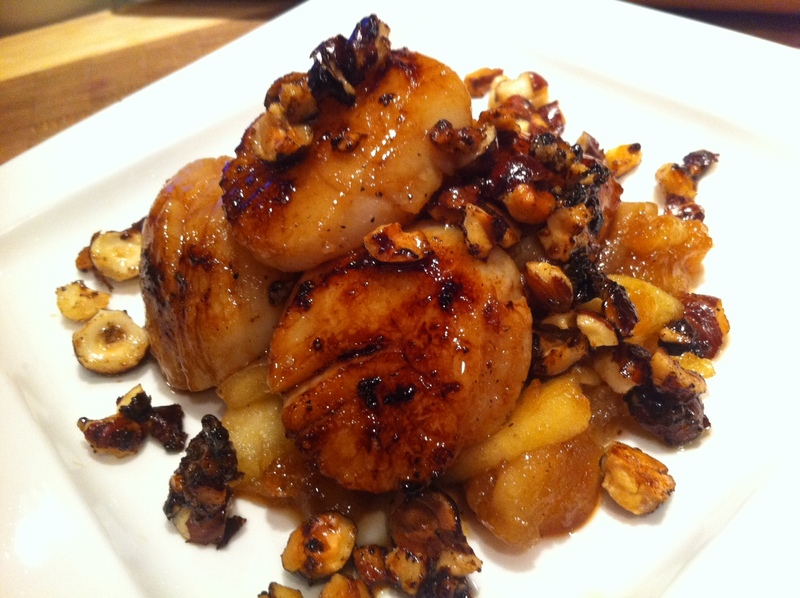 Sauteed Scallops over a bed of apple compote. Ingredients for 1 person: 1 apple cored, peeled and sliced, 4-5 scallops, 1 tbsp of brown sugar, 1 tbsp of butter salt and pepper to taste. In a small frying pan, melt the butter. When the butter is sizzling, add the broken hazelnuts and saute them for a few minutes just enough to toast them. Remove them from the pan, and set them aside. In the same frying pan, melt 1 tbsp of butter and when the butter is sizzling again, add the apples and saute them. Add 1 tbsp of brown sugar and stir well. Cook for 5 minutes stirring constantly to avoid the caramel to burn. When the apples are turning golden and getting softer, remove them from the pan and set them aside. In the same frying pan, add 1 tsp of butter and melt it. When it sizzles, add the scallops and saute the scallops for 2 minutes on each side. Et Voila! To serve spoon the apple confit on the plate and place the scallops on top. Add a few hazelnuts over the scallops and devour!! !